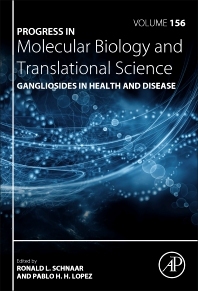 Gangliosides in Health and Disease, Volume 156, presents the latest information on Gangliosides, a class of glycolipids that are found on all vertebrate cell surfaces, and are particularly abundant in the brain. Individual chapters in this new volume cover Gangliosides as Toxin Receptors, Gangliosides in Cancer Cell Signaling, Gangliosides in inflammation and neurodegeneration, Gangliosides as functional galectin receptors, Gangliosides in signal transduction, Gangliosides in brain tumor immunology, and Gangliosides in axon regeneration and stability, amongst other related topics. This book brings together world experts in ganglioside structure and function who have been assembled to contribute to this thorough update of the field. Ronald Schnaar, Ph.D., has performed and directed glycobiology research for over 40 years. He received his doctoral degree studying glycan recognition at Johns Hopkins University, and then completed a postdoctoral fellowship in neurobiology at the NIH before returning to the Johns Hopkins School of Medicine as a faculty member, where he currently holds the positions of Professor of Pharmacology and Molecular Sciences and Professor of Neuroscience. His research focuses on the roles of glycans and glycan recognition in intercellular interactions in the nervous and innate immune systems. Dr. Schnaar’s studies on gangliosides, the major glycans of nerve cells and axons, revealed their role in axon-myelin interactions, including stabilization of axons and the control of axon regeneration after injury. The latter studies led to successful pre-clinical testing of the enzyme sialidase to enhance recovery from spinal cord injury. In collaborative studies he identified distinctive gangliosides on human neutrophils that initiate neutrophilic inflammation and glycans on human airways that down-regulate human eosinophilic (allergic) inflammation. Dr. Schnaar has served as the Editor-in-chief of the journal Glycobiology, President of the Society for Glycobiology and Steering Committee Member of the Consortium for Functional Glycomics. He currently is studying the role of gangliosides in modulating excitatory neurotransmitter receptors involved in learning and memory, and directs the Lung Inflammatory Disease Program of Excellence in Glycosciences, a multi-institutional NIH-funded program to harness glycan recognition to treat asthma and other inflammatory lung diseases. Dr. Pablo H. H. Lopez works at the Laboratorio of Neurobiología, INIMEC-CONICET-UNC.